How in the name of natural science did my urban vegetable garden in the picturesque hamlet of Waiuku produce such a splendid spectacle of virility as this magnificent Kumara. I've been told the land was fertile but this has redefined the term. Why does it have veins? What ungodly power does this pulsating purple war hammer hold within it's rigid core? Who placed it in my soil? Odin himself?? Is the great architect now sitting back in their chair proudly admiring their work with the satisfied smile of a 13 year old kid who has just mastered the art of phallic drawing in the back of their maths book? Whole civilisations of idol worshippers have probably sprung up in humankind's history for less provoking natural wonders than this Kumara. If this was dug up in the mountains of ancient Peru it would be heralded as a sign of great fertility and prosperity for the coming seasons and would be hauled to the summit of a mountain by a hoard of devoted adorers to be sacrificed to the rising sun. If you gave Michelangelo a bar of modelling clay and challenged him to come up with the most vulgar phallic representation of male genitalia that he possibly could, he would throw down his tools in despair if he saw what my Kumara patch just produced. If his David statue had half the potency of this monstrous demon it wouldn't be on public display today & Goliath would have backed out of the fight real early on. 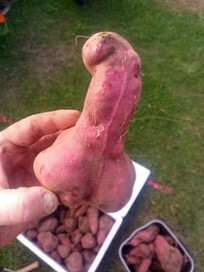 If you buy this Kumara you are not simply buying a Kumara. You are buying prosperity itself. You are buying a wonder of the natural world & a pinnacle of botanic evolution. I believe I have been gifted this botanic beast for a reason so am auctioning it off. Every dollar of this auction will go to the Prostate Cancer Foundation of New Zealand to help with their work. One day you or someone you know may need them. Please read the questions and answers for this listing.